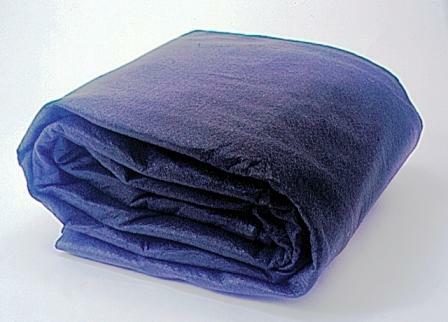 This soft, polyethylene fabric will last 20+ years under your liner. It is a 3-dimensional underlayment that allows gases to escape. It has a non-slippery surface and provides protection for the liner from rocks and other sharp objects, spreads easily, and saves time compared to using newspaper or sand. This is a non-woven, 4-oz. needle-punched Geotextile. We sell this Custom Cut Underlayment for $0.45 per sqft. If you want a cut piece that is 4' long by 14' 11" wide, then order 4 as your quanity in the box above. & we will ship you a custom cut piece of underlayment that is 4' long x 14' 11" wide. We use this underlayment in all of our water feature installations. Anywhere we install EPDM liner, we first put down 1 or more layers of the underlayment. The amount of layers is determined by how clean the soil is under the liner. If there is not a lot of rocks or roots, one layer will do. If you are installing pond liner over rock, roots, or sharp debris, then we recommend putting a layer of sand or stone dust down first on all of the horizontal surfaces. Then follow-up with a layer of underlayment. If your sidewalls are bad, then sand won't work for vertical surfaces. This is where we would double or triple layer the underlayment so we are protected against punctures in the liner from buried debris. If you are placing large rocks in the pond, cut a piece of unerlayment to go between the rock and the pond liner. If the rock is very rough, use several layers of fabric. Most punctures are caused when you go to re-position a rock when it is on top of the liner. As you swivel the rock, it grabs the liner and creates a tear. This can still happen if you use a scrap piece of pond liner. Rubber against rubber grabs and can still tear the pond liner. That is why TJB-INC recommends using a piece of underlayment (instead of extra liner) under the larger rocks. Do not worry how it looks. When you add the smaller filler rocks and the gravel, the piece of underlayment you used will be covered up. Underlayment is cheap compared to having to go back and finding a leak(s) & repairing it!